Use of this article (entire thread, any parts) is not permitted for commercial purposes! Triode-heptode for frequency changing, HF and AF amplification; supersedes the ECH3, released at the beginning of 1940.
gc 0.75, gm 2.2 mA/V; Ih = 0.35 A. After Philips's diversion from mixer valve development with the octodes, and particularly with the ECH2 and EK3, then finding their way again with the ECH3, now with the ECH4 triode-heptode a design showing the way forward was found, which some months later turned directly into the ECH21, and some years later, with only minimally changed characteristics, to the ECH81. This ECH81 then became the almost exclusively used type of mixer valve in continental Europe up to the end of the valve era. In contrast to the ECH3, the mixing system of the ECH4 is a heptode instead of a hexode and the triode grid is led out separately from the grid 3 of the mixing system. The additionally introduced suppressor grid enables operation with sliding screen grid voltage with continuously high internal resistance and reduced noise. The heptode can be used like a pentode as an IF- amplifier. The purpose of these measures was to make this valve as universally useable as possible, apart from use as mixer valve, with the goal of limiting the number of receiver valve types. With a valve complement of ECH4, ECH4, EBL1 and AZ1 one could develop an adequate superhet. The first ECH4 is connected as before as mixer valve. Of the second ECH4, the heptode section is used as IF- amplifier, as the input signal is applied to the first control grid and the second control grid (G3) is connected to cathode. The triode system serves as first AF stage, while the diodes of the EBL1 are used for detection and AVC and its pentode section works as AF output stage. released at the beginning of 1940. Pentode; gm 2 mA/V; Triode µ 20; Ih 0.2 A. The ECF1 was developed to enable the design, together with an ECH3, an EBL1 and a rectifier valve, an adequate superhet with six tuned circuits. The ECH3 is used as the frequency changer, the triode of the ECF1 as 1st AF stage, its pentode as IF amplifier, while the diodes of the EBL1 are used for detection and AVC and the pentode section works as the AF output stage. 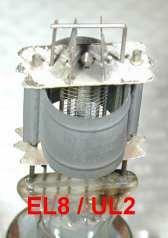 The internal electrode assembly of the ECF1, which was taken from the ECH3, is interesting. Mica plates, holding and screening plates and the triode system are identical, only the grids of the pentode section are different. It is amazing that this pentode contains four instead of three grids, of which the second and the third grid, connected in parallel inside the valve, serve as screen grids. 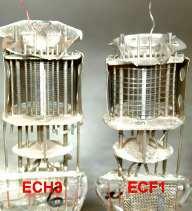 Couldn't one simply have omitted a grid when using the ECH3's structure for the ECF1? The dimensioning of the grids may be different. This is clearly visible with the outer grid in each case: as the second screen grid in the ECH3 it has a fine pitch, while it has a coarse pitch as the suppressor grid in the ECF1. One may ask oneself, why at the same time and for the same design of circuit were the ECF1 and the ECH4 released? The answer for this is somewhat complicated: The heater current of the ECH4 amounts to 0.35 A. Thus it is suitable only for parallel heaters and so precludes its use for AC/DC sets. For the latter, a suitable 100 mA U- series was released, consisting of UBL1, UCH4 and UY1, but this series was not available in all countries. A valve complement of 2 x UCH4 + UBL1 + UY1 needed a heater voltage of 145 V and therefore offered no advantage for countries with predominantly 110 to 130-V mains (e.g. France, Spain.) The ECF1 however could be used there both with parallel heaters, as well as for series heaters with the C- series of valves. A valve line-up for 110-V AC7DC sets was then ECH3, ECF1, CBL6 and CY2. This, like the alternating current version with an EBL1 and 1883, was very common until superseded by the Rimlock series. In countries, where the ECF1 was established, the ECH4 remained mostly unknown, conversely, the ECF1 was not to be found in ECH4- countries. This article was edited 25.Jun.05 17:32 by Jacob Roschy . Since the heater current of the E- signal stage valves was now mainly standardised at 0.2 A, only the output and rectifier valves of the earlier C- series were required for AC/DC sets. These were then adopted into the Red series valves, whereby the output valve mostly received a red shielding collar. 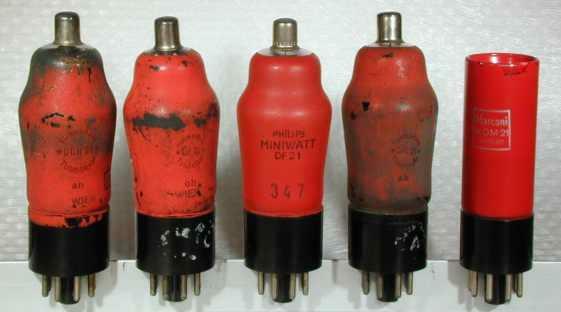 These were used as output valves in the Red series: CBL1 (for 220-V mains), CBL6 (for 110-V mains), CL4 (220V), CL6 (110V), while the rectifier valve was predominantly the CY2. Half-wave rectifier valve for the rectification of the anode voltage directly from the mains voltage. Introduced 1934. 250V, 80 mA. CY2: Half-wave rectifier valve with two diodes for the rectification of the anode voltage directly from the mains voltage. With 110 V-AC mains voltage doubling is possible. 250 V, 2 x 60 mA. With parallel connection of both diodes 120 mA can be obtained. With voltage doubling however, only 60 mA. Pa 9 W, Ia 45 mA, 200 V HT supply, gm 8 mA/V; Vg1 -8.5 V.
The pentode section is like the CL4, with additional diodes for detection and AVC. 9 W, 45 mA, 200 V HT supply, gm 8 mA/V; Vg1 -8.5 V.
An AC/DC type particularly for 110- to 130-V mains. 9 W, 45-50 mA, 100-200 Va, 100 Vg2, gm 8 mA/V; Vg1 -8.5 to -9.5V. The CL6 is identical to the CL4 except the screen grid rating is 100 V.
Output pentode + double diode, AC/DC type particularly for 110- to 130- V mains. 9 W, 45-50 mA, 100-200 Va, 100 Vg2, gm 8 mA/V; Vg1 -8.5 to -9.5 V. The CBL6 is identical to the CBL1 except the screen grid rating of 100 V.
For AC/DC set with series heater strings, valves of the Red E series could be used in most cases in the signal stage valves since their heater power of 1.26 W corresponded both to a tension of 6.3 V as well as a current of 0.2 A. However this did not apply to the two monster mixer valves ECH2 and EK3, since their heater power was substantially higher. Therefore AC/DC versions CCH2 and CK3 were created, whereby the CCH2 consumed a full 29V as heater voltage and the CK3 still needed 19V. This article was edited 25.Jun.05 17:34 by Jacob Roschy . From 1938, Philips and Mullard (a subsidiary of Philips) started to supply Great Britain with Red series valves with the American Octal base after side-contact valves were found not to be generally accepted in the UK, possibly due to negative propaganda by the competition. The pin allocation of the American Octals was adopted, with the heater on pin 2 and 7, screen on pin 1, cathode on pin 8, also the grid cap has the diameter 6.35 mm (1/4 inch) as the US Octal. The EBC33 has the same base connections as the 6Q7, the EL33 as the 6V6, etc.. The glass bulbs however kept their shape like before. The type number was formed by adding 30 to that of the corresponding side-contact valve. The side- contact EBC3 became the Octal EBC33, the EL3N became the octal EL33 and is therefore fully identically the 6M6 in France, which is also an octal version of the EL3. 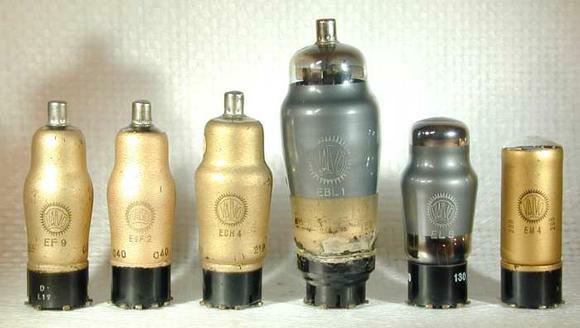 As well as an ECH33 (which was soon discontinued) there was an ECH35 with Ih 0.3A, which is nearly identical to the French 6E8 and a CCH35 with Ih = 0.2A, Vh = 7.0 V.
Some these valves have approximately similar characteristics to American Octals and were partially interchangeable, e.g. EB34 with 6H6 or EF39 with 6K7. The data which can frequently be found are simply wrong such as the EF39 being equivalent to the 6K7 or EB34 = 6H6. Such substitutions functioned "more or less" in most cases, but the "wrong" valve may not give full performance and also can be overloaded. With series heaters, due to the different heater currents 0.2 / 0.3 A there can be resultant problems with under- or over-heating. An ordinary superhet could have, for example, the valve set ECH33, EF39, EBC33, EM34, EL33 and AZ31. It is somewhat amazing that there is an EBL31, but no associated ECF31 or ECH34, with which one could have built a 4-valve economy superhet, as with the EBL1 + ECF1 or EBL1 + ECH4. So the EBL31 could be used only in superhets without a first AF stage. Otherwise again a separate 1st AF (pre-amp.) valve would have been necessary, so there would not have been any saving with the EBL31. Apart from the E series, valves were also added from other series, e.g. from the C-series CBL31, CCH35, CL33, CY31, CY32; from the D series of DAC31 -32, DCH31, DF31 -33, DK32, DL33 -35 and DLL31; from the K series of KBC32, KF35, KK32, KL35 and KLL32. This article was edited 25.Jun.05 12:06 by Jacob Roschy . 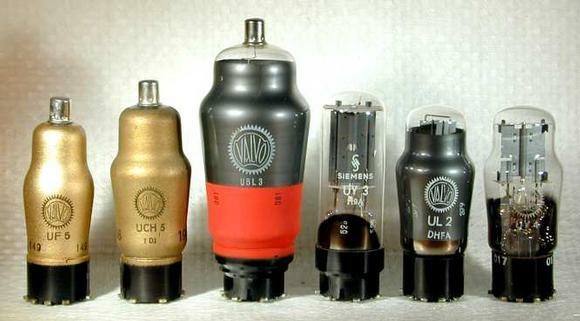 In 1940, as a reaction to Telefunken's steel U series of 1939, Philips also brought out a U 100 mA AC/DC series, consisting of UBL1, UCH4, UF9, UM4 and UY1(N). It is another Red series with Octal base, which however differed clearly in design from the English E30 series from Philips/Mullard. This series was intended to be used in circuits like those with the combination of ECH4 and EBL1, i.e. a superhet could be made with UCH4+ UCH4 + UBL1 + UY1 and larger sets could have a valve set of UCH4 + UF9 (IF) + UF9 (AF) + UBL1 + UY1 and a magic eye UM4. There was a practical disadvantage that now the AC/DC version of a valve series had a different kind of base from the corresponding alternating current series, which clearly made the simultaneous production of AC-only and AC/DC sets more difficult for the radio set manufacturers. 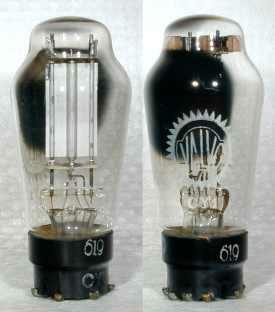 The base wiring differed from the American standard, as the heater was put on pins 1 and 8, which is reasonable in principle. The American allocation of the heater on pin 2 and 8 is the second most inappropriate allocation possible; only the use of a diagonally opposite pair of pins would be worse. Also one can ask oneself whether it was sensible to maintain the previous top cap diameter of 9 mm instead of 6.35 mm like the US Octals. Instead of numbers in the 30s, with no consideration of the different base, numbers from 1 to 9 were chosen. Since a valve set with 2 * UCH4 + UBL1 + UY1 needs a heater voltage of 145 V, this series was not sold in countries with predominantly 110- 130V mains at the time (e.g. France, Spain). Probably the mass production of this new valve technology was not yet in fully swing, so the Octal U-series in conventional technology was produced simultaneously. The UBL1 has in principle the same function as the EBL1, however with the heater data 55 V 0.1 A, a maximum anode and screen grid voltage of 200 V with 55 mA anode current, 11 W anode dissipation and 5.2 W power output. The UCH4 is, apart from the heater rating of 20 V / 0.1 A and the base, identical to the ECH4. The UF9 is, apart from the heater rating of 12.6 V / 0.1 A and the base, identical to the EF9. The UM4 is, apart from the heater data 12.6 V / 0.1 A and the base, similar to the EM4, however the UM4 was optimised for operation on voltages of 100- 200 V.
The UY1 (N) is a half-wave rectifier valve for maximum 140 mA anode current with maximum 250 V alternating voltage with heater rating 50 V 0.1 A. The UY1N, which soon replaced the earlier UY1, differs from it by having additional wire links in the base. This article was edited 25.Jun.05 09:46 by Jacob Roschy . The Red D 21-series of valves: Also in 1940, Philips brought out valves with 1.4 V- heaters for use with dry batteries for the first time, superseding the K-series, which were for use with 2 V- accumulators. The heating with dry batteries became economically possible once the current required by the filaments had to be substantially reduced compared to the K-series of valves. As identification, the letter D was assigned. The choice of the number series of 21 was less clever, since these valves were octal-based, and 21 was already assigned to the Loctal E 21 and U 21-series valves. The confusion was further increased, as in the UK there were also similar octal-based D- battery valves. However, these were given the -31 number series which was already standard for the octal E and C series. Even later, Loctal battery valves in the D25 series appeared. High-performance valves, for optimum receiver performance. DL21: Output pentode, If 50 mA, max. 260 mW output. DAH50: Heptode with space charge grid + diode, 15 V supply, gm 0.65 mA/V, for miniature and amateur-built receivers for use with headphones. This article was edited 25.Jun.05 09:57 by Jacob Roschy . Germany after 1945: Red becomes gold (again) ! Firstly in many countries of Europe, but not in the German Reich where they were prevented by the Telefunken monopoly, - then later, after they were virtually obsolete everywhere else, from 1947 to approximately 1950 in the West zones of the former German Reich, which became the "Federal Republic of Germany" in 1949. The Philips all-glass Loctal valve series (ECH21, EBL21) had come out in 1941 and from 1947, the first Rimlock (B8A) valves from Philips in the Netherlands. However because of the post-war situation, Valvo was unable to manufacture any more-modern valves than side-contact ones, made with the conventional pinch technique. Instead of in red though, they appeared with a gold-coloured coating. This was possibly in reaction to a negative campaign which Telefunken had led against the Red valves before 1945, in order to maintain the monopoly of Telefunken steel valves in Germany. After large numbers of these valves had been supplied and had become familiar and proven, they appeared later, and as replacements, in red again. The largest production numbers were reached by the valve types which were used orignal equipment in the postwar "Standardsuper." This was a common product first from the setmakers of the British zone and then immediately after from all west zones. Its valve complement of ECH4, ECH4, EBL1 and AZ1 was also used at this time in many other sets and so was generally considered to be the standard line-up. EBF2, EBL1, ECH4, EF6, EF9, EL8, EM4 and AZ1. In addition to this now golden (recoloured) AC valves series, an AC/DC series was of course also needed. It was desired to avoid the introduction of the octal U-series UCH4, UBL1, etc., since this would have made the simultaneous production of AC and AC/DC models more difficult for the radio manufacturers and octal valves had not, so far, been introduced to Germany. Therefore these U - valves were supplied with side-contact bases and given another type-number. the UY1 became the UY3. The UF9's counterpart was announced as the UF10, but was never supplied under this designation. It was first presented in January 1949 as the UF5, together with the UF6 and the UL2. Because of the possibility of confusion with the Telefunken's steel - 11 series, UF5 was now chosen instead of UF10, however the UF5 has no connection with the EF5 which had become outdated by this time, but instead has the EF9's characteristics. A side-contact version of the Octal UM4 was not produced. Straight pentode, intended for use as detector valve for Einkreiser and Zweikreiser circuits* Identical to the EF6 except the heater rating of 12.6 V / 0.1 A. 5 Wa, 200 Vb, 20 mA, gm 5.5 mA/V. The UL2 has no connection with the EL2 car radio output valve. Since the EL2 has only low sensitivity, it was decided to make the UL2 a completely new design. The UL2 is so sensitive that it can be fed directly by a detector valve, e.g. with a UF6. the 6.3 V- AC version of the UL2. 5 Wa, 250 Vb, 20 mA, gm 5.5 mA/V. (Same purpose in AC- sets as the UL2 in AC/DC- sets). Since there was already a EL2, the designation EL8 had to be used. It is remarkable that the supressor "grid" of the valves UL2 and EL8 actually only consists of the support rods, as had become the practice with the Telefunken ECL11 and UCL11 valves, which however were called tetrodes, while UL2 and EL8 were officially called pentodes instead. The anode is elliptical, so the main beam of electrons has the longest distance between cathode and anode. Half-wave rectifier valve to obtain HT by direct rectification of the mains supply. Especially for sets using an UL2 output valve. 250V, 55 mA. ECH4 + ECH4 + EBL1 + AZ1 (alternating current) or UCH5 + UCH5 + UBL3 + UY3 (AC/DC) for "Standardsuper" and many other sets. ECH4 + EF9 + EBL1 + AZ1 or UCH5 + UF5 + UBL3 + UY3 for superhets having 6 tuned circuits, without an AF pre-amp. stage ("short" superhets). The EM4 was intended for use as a tuning indicator with this AC series; for AC/DC only the octal UM4 was available. This article was edited 14.Nov.05 19:49 by Jacob Roschy . This is my first longer article in English. Special thanks goes to Martin Crossley, UK, who did the major part of the translation. He shares an interest in valves which helped to "round off" this article. This article was edited 21.May.05 10:25 by Jacob Roschy . Your article (serie 1-3) "The Philips Red Valves Series" is an excellent and complete presentation of the "red tubes". I read it with great interest. Thank you very much for your excellent English language article series. Your addition of a UK/American English glossary is a very good practice that RM members should start to include in major articles such as yours. As an American collector, your series focusing on European Valves is very interesting because it covers a different path in Valve development. But Telefunken also produced red tubes, and use them, at least in Poland in their factory. Hetre is a photo of red Telefunken tubes from my colection. This article was edited 22.Apr.14 20:40 by Ernst Erb . Fortunately we have copies of the Telefunken producing lists "Röhrenfertigung Telefunken"
no EBC3, no EBF2, no EK2, no EF5, EF6, EF8, EF9, etc. at all ! These small production numbers can only considered as experimental samples, but not for sale purposes. It was common practice, that tube makers sold even tubes they didn't make themselves, only to claim “we sell any tube”. They bought these tubes from other makers and sold them under their own name. On these allegedly Telefunken red tubes one can see markings at the bases that clearly indicates a Philips origin. As example, just compare the base markings at this “Telefunken” ECH3 with the markings of this Dario ECH3 . (Dario was a Philips owned tube company in France). 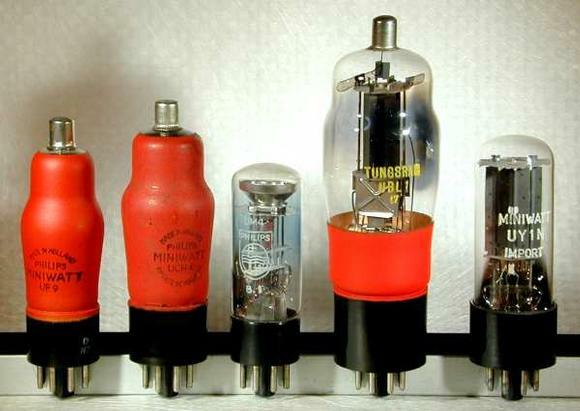 Whenever you see red Telefunken tubes, it is very likely they wasn't make by Telefunken ! the Telefunken producing list says, that 11514 pieces of EL3's was produced ! Why this ? The answer is simple: the Telefunken EL11 is identical with the EL3(N) with exception of the base ! So they only needed to put on a P8 base onto a EL11 bulb – and the EL3 is there ! This article was edited 21.Apr.14 19:28 by Jacob Roschy . It could be wrong in my opinion. Polish Telefunken factory used red tubes in 1938/39 and 1939/40 seasons, at least EF9,EF6, EL3, and EFM1. They was normally used in popular radios, so they have to be produced in bigger quantities tham only samples. Telefunken does not have tube factory in Poland all tubes were imported, probably from Germany. 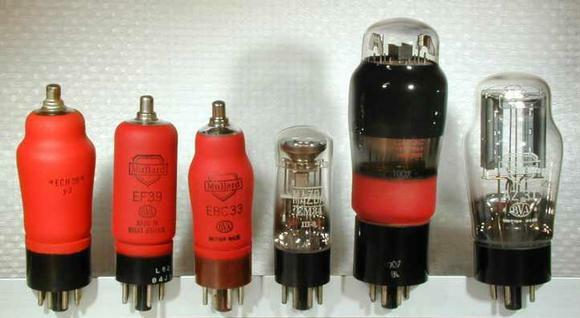 I attach a photo of two additional red tubes from Telefunken: ECF2 and EBC3 (pgotos from Ebay). ECF1 could be produced by Dario. Some other interesting thing: red ABL1 from Philips.